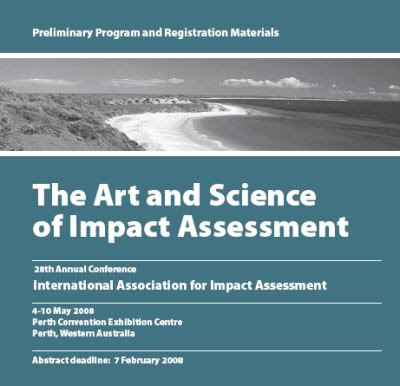 The 28th Annual Meeting of the International Association for Impact Assessment takes place at the Perth Convention Exhibition Centre 4–10 May 2008, and paper and poster submissions are now open! The Preliminary Program (attached) is packed with a range of Theme Forums and Concurrent Sessions, grouped into 14 different topic streams. After the conference, a special technical tour of the Pilbara, “Minerals, Management and Magic” is available to interested participants. Please note, deadlines for submission of papers have now closed. Please see the Preliminary Program or www.iaia.org for further details.